I want to make a sweater of mushroom colours to wear when I go to Sweden in September for the next Fungi & Fibre Symposium. The first step was to play with all my mushroom skeins and lay them out to see how I want to arrange them. Because I want to emphasize the colours, the sweater itself will be of a very basic design. So I phoned my fibre mentor, Yvonne, who suggested sliding pieces of cardboard under the skeins and taping them in place. A search of the basement turned up two large pieces of mat board (I used to mat and frame a lot of my photographs), so I was able to get by with just two of those. 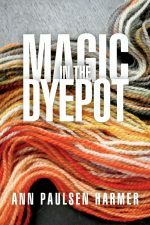 I didn’t tape each skein in place – that would have taken forever – but looped large lengths of tape over several skeins at a time until everything was secured. These are now waiting under the bed until such time as I can develop an appropriate pattern (Yvonne will help me with that, too). 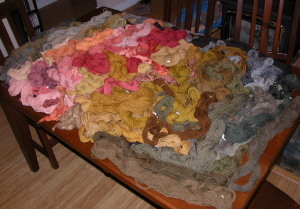 Then I can just pull them out and take each skein off when I need it, thus keeping the colour arrangement in place.